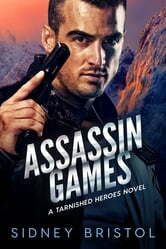 Assassins, Romance, Cold and worth you time. Trust is the only thing that can keep them alive ! With this installment in her Tarnished Heroes Series, Sidney Bristol keeps the tempo going. Carol works for the CIA through she is just an analyst, her father was a legend in the bureau. And was murdered doing his job. Carol has been working on an undercover assignment. Only her boss knows about her involvement. There is a mole in their ranks and it's her job to find out who. Somehow that mole has found out about her. She needs protection until she can complete analyzing the data. When Andy is given the assignment. Something about her even from a picture intrigues him. He decides the best plan is to do what's called a soft meet. Meet her as someone else to get a feel for her. Hoping that this will help when he kidnaps her. She ’ll at least recognize him even if it is as Mark. He meets her as Mark and then they start texting. Andy can’t help himself and Carol feels the same pull. So when she wakes up in a strange place she starts to put things together. She's been taken and not sure if Andy who met her as Mark is a good guy or a bad one. This is where the fun begins. They now can trust only each other. Him being a spy and her being to him a pencil pusher is going to make this interesting. On top of everything else, they are falling for each other. So hang on because this just became a very bumpy ride. The characters are well developed and the flow is perfect. The ending is a surprise I did not see coming.